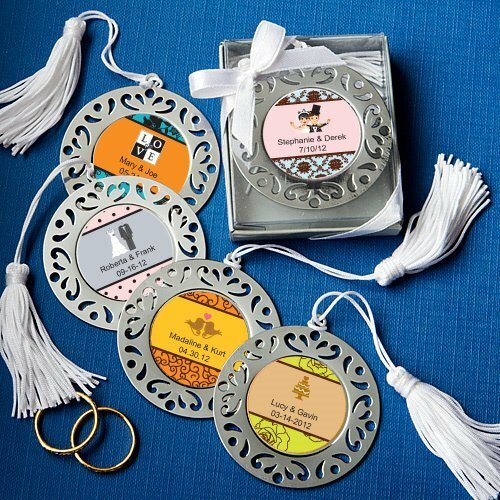 Make your day truly memorable with the addition of these personalized bookmark favors! Our damask design bookmarks feature a 2" round metal charm with cutout border. The charm is attached to a 4" white tassel, and is personalized with the addition of a custom label. Choose from hundreds of design and color options during checkout, then add the bride and groom's names and wedding date. Each favor is packaged in a clear-topped display box with white satin ribbon and bow. Minimal assembly is required to adhere the labels to each bookmark.